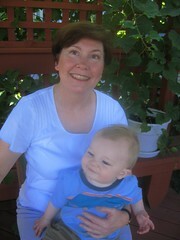 OK, Finn, now say "Mama"
There really isn't anything like hearing your baby say "mama" on demand. Especially if you're his mama. Here, I bribe Finn with a cookie, which he lustily devours, and murmurs his expanding vocabulary on demand. He's become quite the mimic, like a miniature human beatbox or that guy from the Police Academy movies who could convincingly imitate a lawnmower or siren. Although the great Finnster rarely allows himself to be contained, he does love a good game of choo-choo along the floor in the laundry basket. You think things are rough? Imagine you had to learn to crawl all over again, and you weren't quite sure how your arms and legs worked yet. 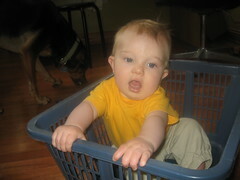 Finn reminds us that being a baby isn't all teddy bears and footie pajamas. 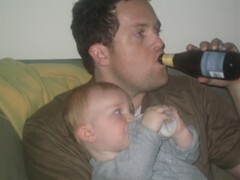 Both like to kick back with a bottle at the end of a long day. 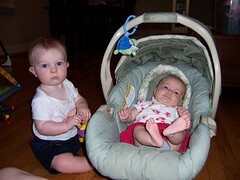 Here is Finn, looking like a moose next to teeny little Gracie Weir. 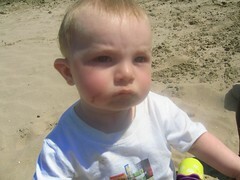 Unfortunately, Finn's enthusiasm here shows pretty much how much he enjoyed his first day at the beach. It was bright, sunny, and when your skin is so white it glows and you don't consider yourself much of a "hat guy" (he would pull it off every time I tried to put it on), you're not in for much fun. Mostly, he wrestled his hat off his head and ate handfuls of sand. Our first visit was a short one, but I'm hoping to travel a little smarter next time.